Both Cota models use an aluminum chassis with a gorgeous finish, showcasing the classic lines and the impeccable manufacturing quality. The Cota 300RR also features new, suppler settings for the Tech fork, similar to those used by factory riders. The muffler uses reinforced mounts, and the rear-brake pedal is shorter to avoid impacts and allow the rider more freedom of movement. Both Cota models feature fuel-injected power that’s easy to modulate, for the surgical power delivery so critical to trials riding. Specifically tuned for low-rpm response, they’re also extraordinarily flexible, with plenty of power and torque all the way through the rev range. A bigger cylinder bore and longer stroke means the Cota 300RR increases its displacement to 288cc, while the 4RT260 retains the reliable 260cc four-stroke engine. A high-pressure fuel pump helps give the engine a stronger power curve. The Cotas’ Honda engines use battery-less digital ignition systems, and include a bank-angle sensor to switch off the ignition when the motorcycle is lying on the ground. The Cota 300RR also incorporates a magnetic kill switch. Both 2017 Montesa Cota models are equipped with a 4-piston monoblock front-brake caliper. Each Cota uses 32-spoke wheels. The rear wheel features an innovative system incorporating central-adjustment spokes for a significant weight reduction, and which also allows the Cota to fit tubeless tires. The Cota 300RR comes with premium Michelin X11 tires, laser-engraved hubs, and light DID aluminum rims. Does your course feature sections with poor traction, followed by sections with better grip? No problem—the 300RR and 4RT260 both feature a handlebar-mounted mode switch that lets you choose between two maps/modes to change engine power delivery. For 2017, the 300RR is even better, with new ECU mapping that improves engine response in the low and middle rpm ranges. Now both Cota models feature a longer kickstart lever, helping ensure easy one-kick starts no matter where you are on the course. 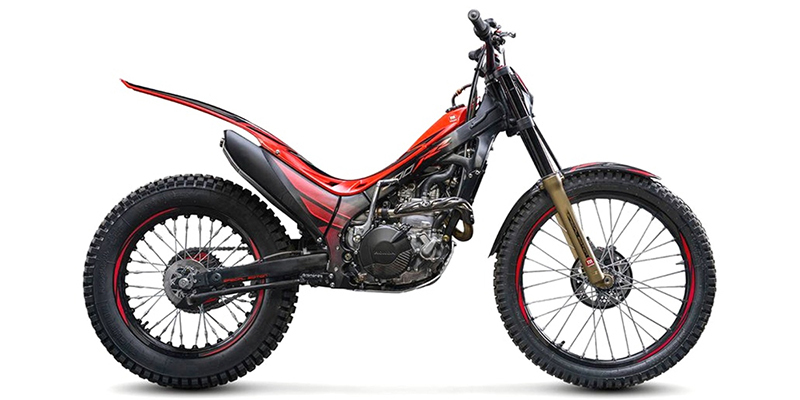 The Montesa Cota 4RT260 offers an adjustable 39mm TECH fork and R16V shock for the Pro-Link rear suspension. The Cota 300RR features a TECH fork with lightweight aluminum tubes and a Showa rear shock designed to improve handling, and overall feel.